Although you might scoff at the idea, unattended candles could be knocked over and present another fire safety risk. Fires can happen even when you least expect it or don’t think they can start. They don’t only roar into life during the warmer months of spring and summer, with something as dramatic as a massive forest fire summoning brigades of firefighters and flights of helicopters to defeat it. In fact, it’s much more common to see a kitchen fire in your home break out. Here are four ways to ensure fire safety in your home this winter. We can’t overstate enough the importance of functional and reliable smoke alarms. You never know when a fire might occur, and it might just happen while everybody is asleep. But a smoke alarm can detect the fumes from a fire and then rouse everyone inside. If the batteries need replacing, then do it. You’ll want to be sure you have a smoke alarm in the kitchen, in the laundry room, and in each bedroom. Putting one in the garage couldn’t hurt, either – especially if you want to have a carbon monoxide detector. But when you live in an apartment, you might only need one smoke alarm for the entire place. Maybe you recently decided to treat yourself to a set of specialty candles. These candles could remind you of your favorite theme park, where you went with your family several months ago. 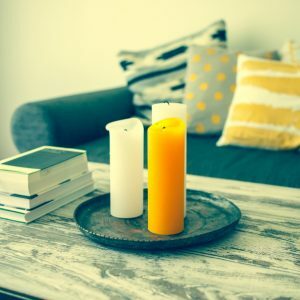 But when you burn these candles to get through the winter doldrums, be sure to keep an eye on them – although you might scoff at the idea, unwatched candles could be knocked over and present another fire safety risk. As we mentioned above, you should deal with any kitchen fires that happen. Whether grease has caught on fire, or you left the oven too long, anything in the kitchen can burn around the heating elements, which is another fire safety risk. While a watched pot never boils, both pots and pans can overheat if you’re not careful. Having a fire extinguisher in easy reach is always a good idea. Put one in the laundry room, and then get more. The second one could be kept in the kitchen. If you have upstairs bedrooms, be sure to have an extinguisher posted there as well. This entry was posted on Friday, February 9th, 2018 at 10:59 am. Both comments and pings are currently closed.